Last night my family sat down together to watch Coraline, which turned out to be the most utterly beguiling creation, artistically beautiful, genuinely frightening, and full of glorious, whimsical, gothic detail. I found myself instinctively grouping it mentally with two other films centred on little girls navigating dark and strange fantasy lands, Hayao Miyazaki’s Spirited Away and Guillermo Del Toro’s Pan’s Labyrinth. All three begin with the traditional plot device of the protagonist moving somewhere new and finding a mysterious place there (for Chihiro it is on the journey, rather than at her new home). Each requires the heroine to solve puzzles, in order to save her parents. Chihiro and Coraline have to challenge a witch to force her to release their mother and father from enchantment, while Ofelia is hoping to cure her mother’s illness. Each is looking for an escape from the bleakness of the real world. I feel the connection between the three, however, is both more specific and more subtle than that. All three are more than willing to get their hands, and every other bit of them, dirty, if it helps get things done. But more particularly, each of these three little girls has to reject the trusting of appearances in order to succeed. Each has to find the ability to see into the fundamental nature of things, instead of what is on the surface. Temptations are put in her way, but embracing them would require her to give up something intrinsic to her sense of self. This they absolutely refuse to do. It’s a long time since I saw Spirited Away, but I know that for many people it is the most beloved of Miazaki’s many adored movies about children. Chihiro, like many people, is ordinary when her circumstances are so, but capable of being extraordinarily tough, insightful and compassionate when thrown into a world with a completely alien set of rules. Chihiro with pigs who may or may not be her parents. Coraline already has plenty of confidence and willingness to be different when her story starts, but is looking for someone to do a better job of recognising it than her perpetually distracted parents. Her learning curve is largely about discerning between alluring facades and true companions. 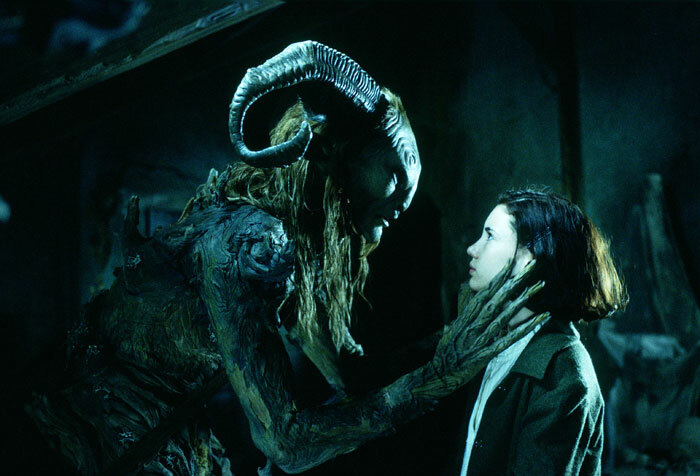 When I first saw Pan’s Labyrinth (which should really be called The Faun’s Labyrinth, if it were to reflect the original Spanish title; the faun figure in the movie is not Pan) it was the video we chose at random the day after I found out I was pregnant. This may account for how hard I was hit by the extraordinarily diverse and explicit fertility imagery that permeates the film, which I have not seen commented on in reviews (perhaps some academic has done an analysis of it, I do hope so). A barren fig tree that begins to bloom again, a bloated toad with a jewel/key in its belly, a table piled with pomegranates, a mandrake root baby, a book that bleeds to form that familiar shape of a medical diagram of a uterus and ovaries, the moon becoming full, it was everywhere. We see everything through the eyes of its wonderful little heroine, faced with troubles much too big for her: an ailing mother, a brutal stepfather and the secret that the servants she learns to love are the very Marxist rebels her stepfather has been sent to crush. Who could fail to love a little girl clutching such a big book while this covered in mud? All three movies also have stunning visuals and a liberal sprinkling of Shakespearean references, but I think the thing that really unites them is this faith in the power of a strong sense of self. Little girls are so often taught to subsume who they are under the imperative to behave a certain way or aspire to certain things, that I find stories like these to offer the best of all possible role models. A note about suitability for children: Reel Girl’s kids were scared by Coraline, but my five-year-old was just excited-scared, so responses might vary. It was actually wonderful watching him so caught up in a story, his eyes were popping out of his head. He kept calling out to her what she needed to do. Spirited Away has nothing that I can recall that would be unsuitable for littlies, but does have a rather convoluted plot, so I will be leaving it until my child has a bit more patience. 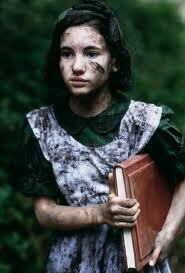 I would not let a child watch Pan’s Labyrinth, the violence is too real, and is at times quite horrific. But if you feel in the zone for a good cry, I don’t think I have ever sobbed so hard at a movie in my life as I did watching that one. ‹ Those who do not know their internet history are doomed to repeat it, clearly. 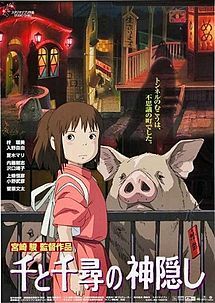 It’s too long since I’ve seen Spirited Away – really need to see it again. My kids both enjoyed Coraline, more so by Sprog the Younger though. I have not yet seen Pan’s Labyrinth. I suspect I’m missing out.